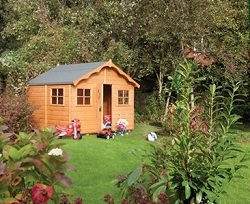 Great range of Wooden Playhouses and timber Wendy houses for children. Ideal for the small or large garden! Wouldn't the children or grandchildren just love a timber playhouse to hide away in, brew the pretend cup of tea and entertain their little friends in style? In our range of children's play houses you will find Wendy houses suitable for both small and large gardens and something to suit all budgets.